Slime mold is an informal name given to several kinds of unrelated eukaryotic organisms that can live freely as single cells, but can aggregate together to form multicellular reproductive structures. More than 900 species of slime mold occur all over the world. Physarum polycephalum can be easily grown in its yellow plasmodial stage. Keep in mind that slime molds are sensitive to light, an excess of water, not enough moisture and contamination through mold. To avoid the latter it is extremely important to work in a clean environment and sterilise all parts prior to using them. 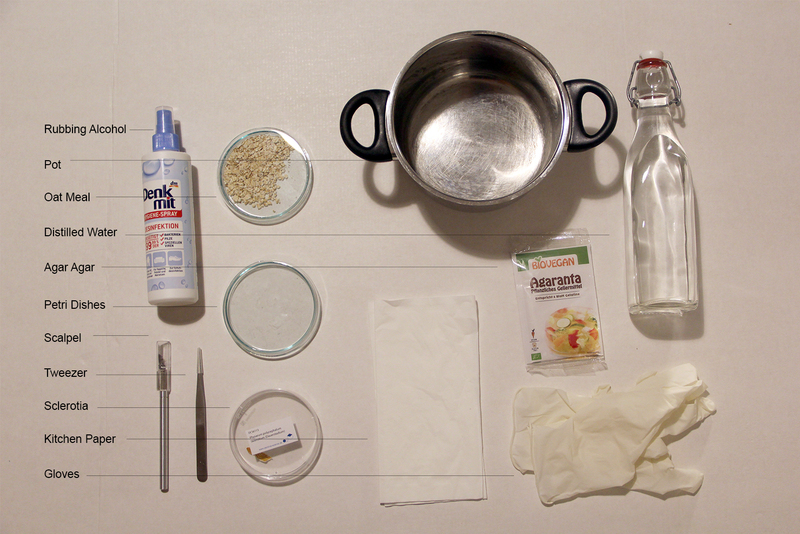 Place the petri dishes and the oat meal in an oven and keep at 160°C for 20 minutes. Clean all other utilities with rubbing alcohol and kitchen paper. Pour 100ml of distilled water into a clean pot. 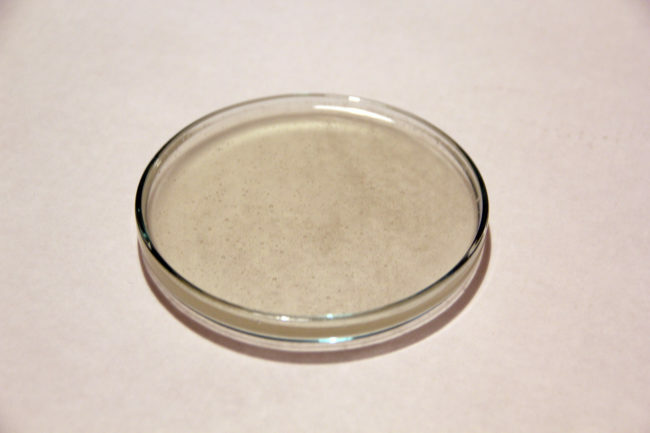 Add one pack of agar agar powder (6g) into cold the cold water (if the agar is mixed into hot water it will clump). 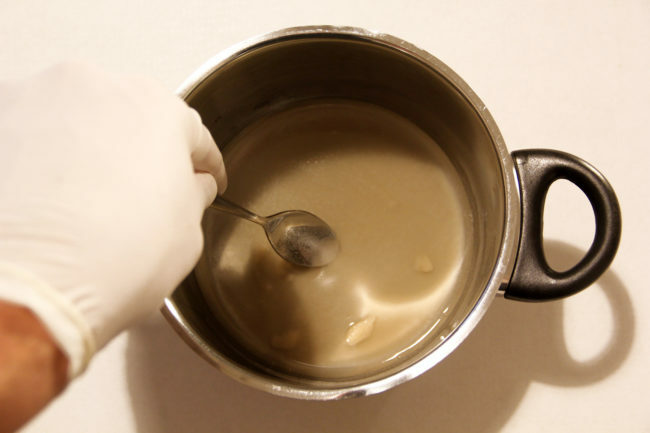 Stir until the agar is completely dissolved. Now bring the mixture to a boil and keep stirring regularly. 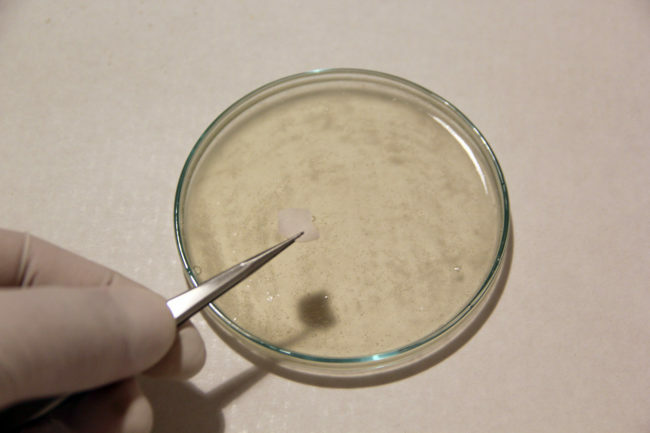 Fill each of the petri dishes with a thin layer of agar. 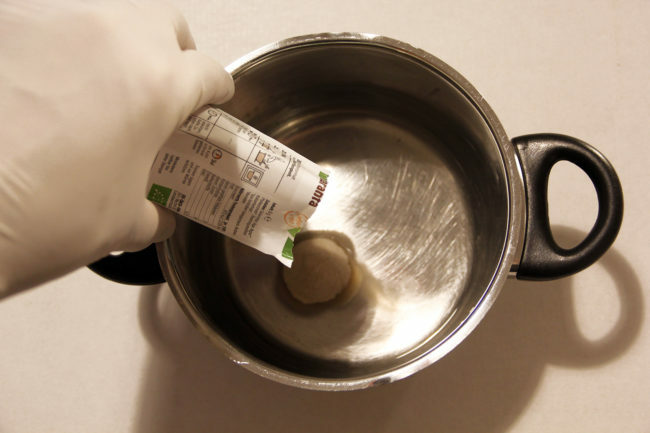 Place the lids on the petri dishes to reduce exposure to microbes and let it harden for 20-30 minutes. 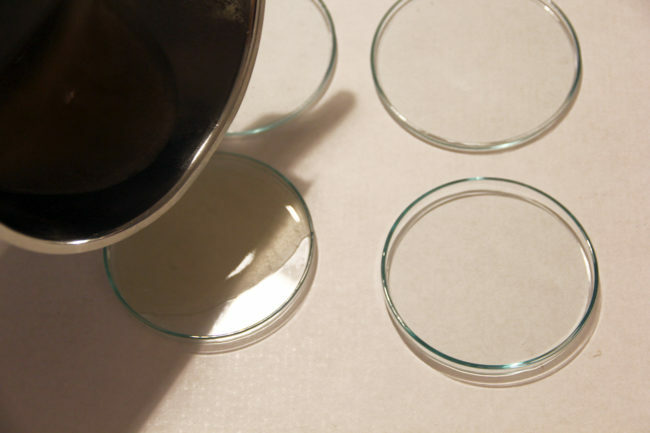 Moisture on the lids can be removed with a piece of kitchen paper and rubbing alcohol. Once the agar has hardened the dry sclerotia can be placed (facing downwards) onto the petri dish. Prior to seeding the sclerotia can also be divided into smaller parts using the (sterilised) scalpel. Now store the petri dish in a dark place. Growth should already occur after 1-2 hours. 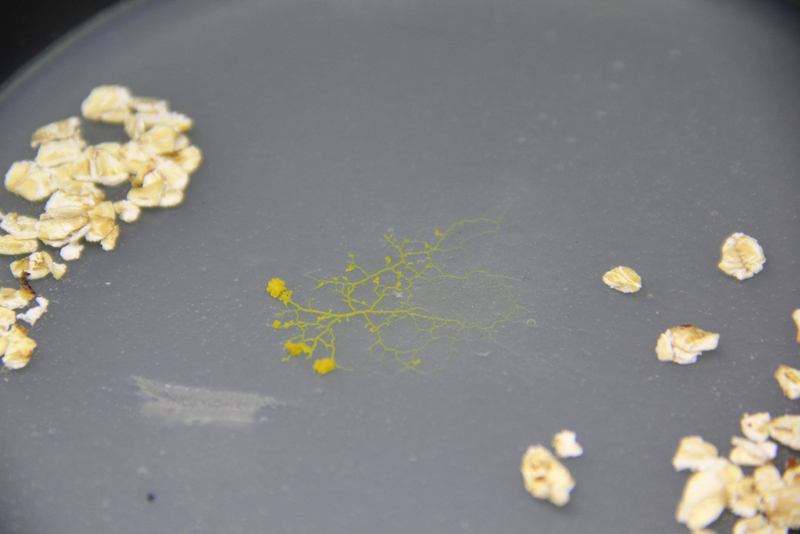 As soon as the slime mold starts looking for food sources add the oat meal flakes onto the dish. Make sure to remove old oat meal to avoid mold. 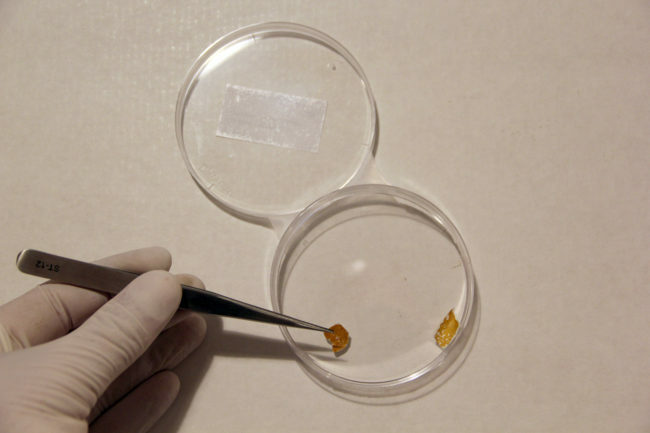 Once a week the slime mold should be transferred onto a new, clean petri dish. 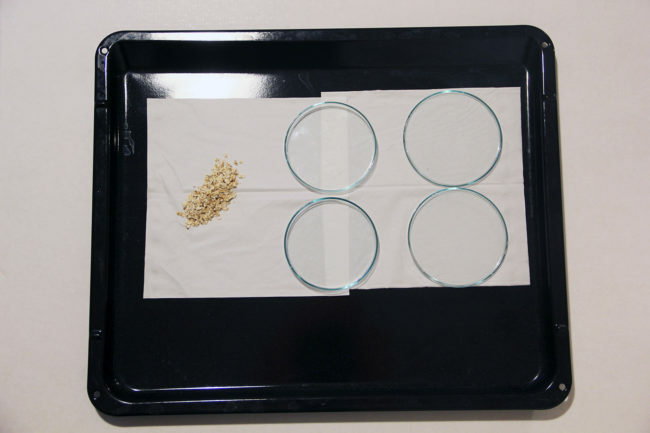 To do so place a piece of (sterile) filter paper with some oatmeal into the dish and wait until the slime mold has conquered it. Now simply move onto the new dish.